I have a little bit of an issue, I LOVE carbs. Seriously, I just can’t get enough of delicious bread. I could probably eat a whole loaf on my own. Give me some homemade bread and I’m in heaven. 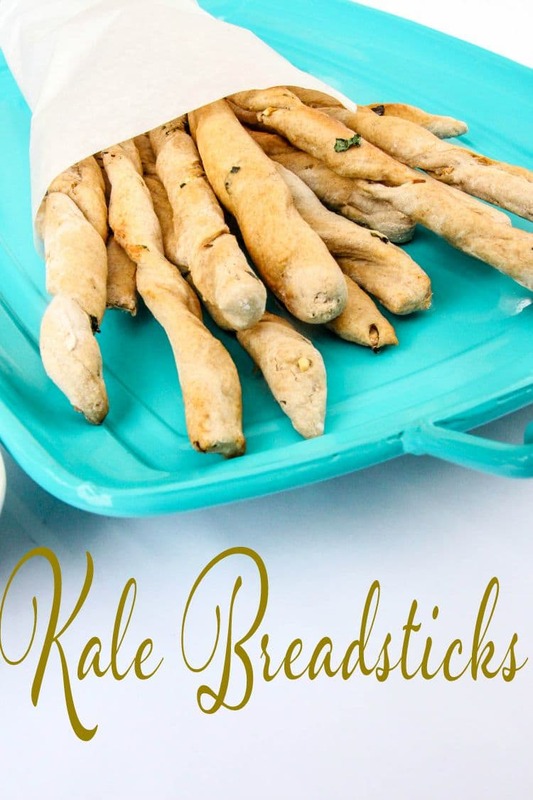 These garlic and kale homemade breadsticks are absolutely amazing and they really aren’t that hard to make. If you’ve never made homemade bread before, you should really give these a try! If you’ve never made homemade bread before, don’t let the processes intimidate you. It’s really not that hard. 1. In a bowl of a stand mixer fitted with the hook-whisk together the yeast, 1 tablespoon flour, and 1/4 cup warm water, let stand for ten minutes or until the yeast has become a thick tan colored foam. 2. Stir together 1 1/2 cups of flour and salt. 3, Add yeast mixture and the remaining 3/4 cup of water, stir until smooth. 4. Add another half a cup of flour and mix. Note: If the dough is sticking to your hands or the side of the mixing bowl then it’s too moist, so add more flour a little bit at a time. On the other hand, if the bread dough is too dry add a bit more water (better to keep the bread dough slightly sticky because you’ll be adding a bit more flour as you knead). 5. Transfer dough to a floured surface and knead for 10 minutes. Place dough in a greased bowl and cover with a damp towel. Let the dough rise for an hour or until it’s doubled. 6. While it’s raising, chop kale and herbs, then mince the garlic and set aside. 7. Preheat oven to 400 degrees. Divide the dough into 3 equal parts and keep the two parts you aren’t working with covered in the bowl (this will help prevent the dough from drying out). 8. 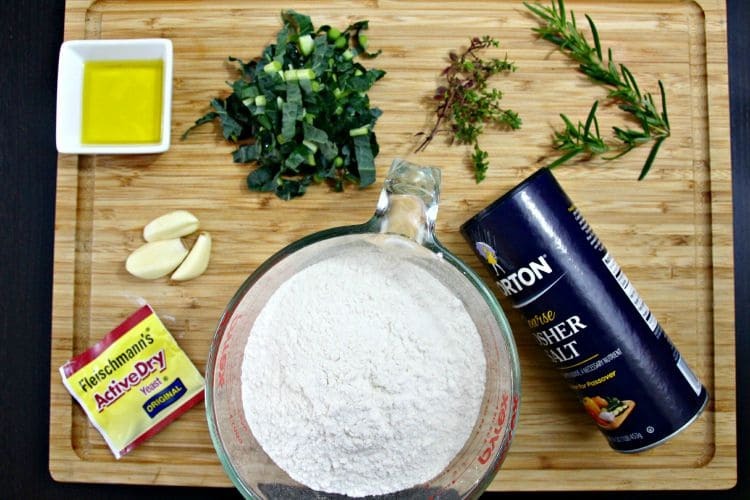 On a floured surface, fold in the kale herbs and minced garlic to the first part of the dough. Knead the dough until kale. herbs and garlic mixture is speckled throughout. Roll the dough into a 9×13 rectangle and use a cookie cutter or butter knife to cut 5 long strips. Pick up a strip, twist it, and transfer to a greased cookie sheet or pizza stone (I used the latter). Repeat with the rest of the strips. 9. Place in oven and bake for 18- 22 minutes until breadsticks are golden brown. In a stand mixer add butter, herbs and honey. Whip on medium setting until peaks form. Kristi, I would have never thought to add Kale to breadsticks. Great idea though. Keeps a little green in the carbs! 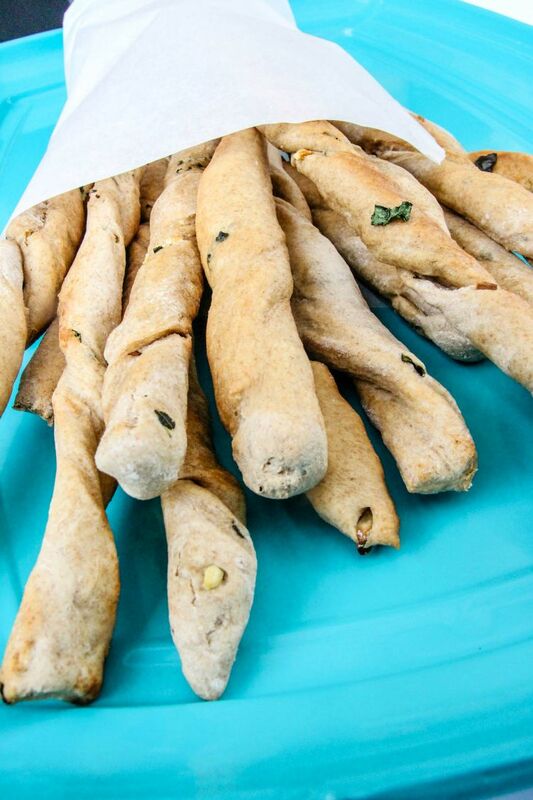 We love breadsticks around here, and garlic’s one of our favorite flavors! Adding kale sounds like a great idea too. 🙂 I hope you can stop on by and share this or any other recipe with us on Five Friday Finds! These breadsticks look amazing! Perfect timing too since my kale is readily available in my veggie garden. Thank you for sharing on #HomeMattersParty! Just wanted to let you know this post was picked as one of the features on the #HomeMattersParty. You can find it at http://adventuresfrugalmom.com/home-matters-linky-party-53/. Make sure to grab the I was featured button for your sidebar. I knew I should have picked up that bunch of kale yesterday at the store! Congrats on your #HomeMattersParty feature.